Part of the 2017 Toronto Film Festival “New Wave” series, Oscar winning actress Brie Larson made her directorial debut with “Unicorn Store”. A welcome surprise and a more impressive actor-turned-director film than Andy Serkis’ “Breathe” which also debuted at the festival that year. Yet no distributor would buy the film, even with an Oscar winner front and center. So sat Unicorn Store for over a year and a half until she became Marvel Comics new “it” girl. Larson’s quirky comedy is about the transition from childhood to adulthood and the screenplay taps into beautiful ideas from both the daughter and parental perspective. It’s completely ridiculous in other scenes featuring Larson’s frequent collaborator ad friend Jackson (they co-starred in “Kong Skull Island” and more recently in “Captain Marvel”), but somehow morphs into this a sweet romance. It’s not just Larson’s direction here but her performance on screen showcases an entirely new side to her acting career. Rejected from a prestigious art school because her visions of color and fantasy didn’t mesh with the school’s agenda. Kit (Larson) returns home discouraged and her camp counseling, insanely positive parents (Whitford and Cusack), only make things worse. Kit refuses to grow up, she still talks to Care Bears, wears some combination of rainbow stripes in every outfit and glitter is a daily obsession. She lands a temporary job at a local ad agency, but a mysterious envelope leads her to “The Store”. A very colorful and excited salesman (Jackson) promises her a unicorn if she meets certain criteria, one of which consists of building a stable in the backyard. Enlisting the help of local hardware clerk Virgil (Athie), he becomes her only friend, despite withholding the true purpose of their project. As a director, Larson comprehends the right about of comedy and never lets this story get so ridiculous it can’t pull back into the realm of reason. Unicorn Store sort of reminds me of a Molly Shannon SNL skit or some ridiculous character from The Office. What begins as entertainingly absurd winds up being very poignant, a metaphor for something emotionally sustaining. Larson who has done her fair share of comedies (Trainwreck, Free Fire) put that sarcastic comic wit on full display that would eventually end up informing her superhero persona. Her performance as Kit exposes range we haven’t even seen hinted in previous work. As a director, she comprehends the right about of comedy and never lets this story get so ridiculous it can’t pull back into the realm of reason. 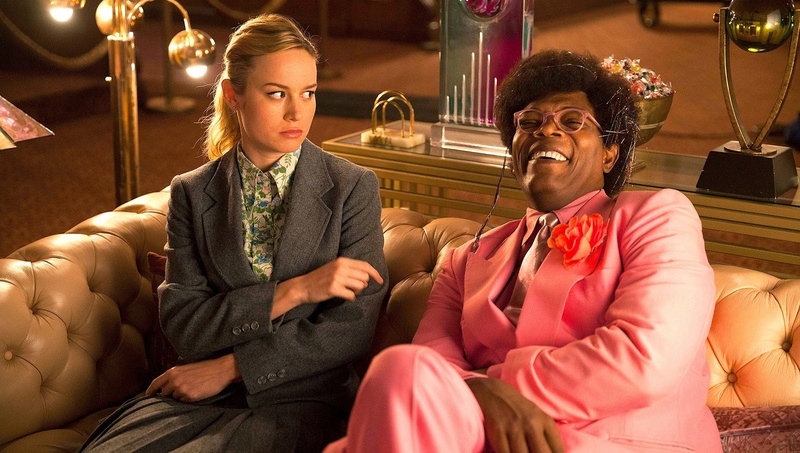 It’s that careful balance that makes Unicorn Store such a charming and wonderfully inviting film. “The most grown up thing you can do, is fail at the things you care about”. Unicorn Store is a surprisingly heartfelt for film that features a character who thinks she is getting a magical animal and wears glitter on a daily basis. Athie is playing a similar role, opposite a unique white girl, to his performance in Patti Cake$, certainly an actor on the rise. Jackson is only here to increase interest in this little project. There is a musical performance scene, where Kit pitches a commercial for a vacuum cleaner that’s one of the funnier moments. Larson, naturally funny in conversations when she disagrees with her parents to the temper tantrums she throws, and later brags about. Unicorn Store serves nostalgia for anyone who ever had a plush toy they talked to, or a dream that wasn’t possible. Larson delivers one of the sweetest, most innocent and emotional films through a an absurd premise. Oscar winning actress Larson turns out to be quite the impressive director.